It was large and in-charge, the only thing to look at in the bar area. The piece, as a whole, is striking with that blue butterfly. Then, you see the big QR code. I was the only one in the restaurant at the time so I didn’t feel awkward standing in front of the image, pointing my phone at the QR code and taking a picture of it. Problem was, the QR code would not register with my reader (and I have a very sensitive reader). It didn’t work. After repeated attempts. Lesson #1 for any interactive (especially “Out-of-Home”) experience – make sure it works. 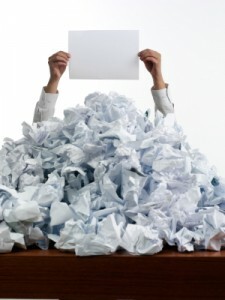 Lesson #2 – if you put something up that looks actionable, make it so. Lesson #3 – compelling visuals (in this case, the butterfly) makes for a compelling experience. 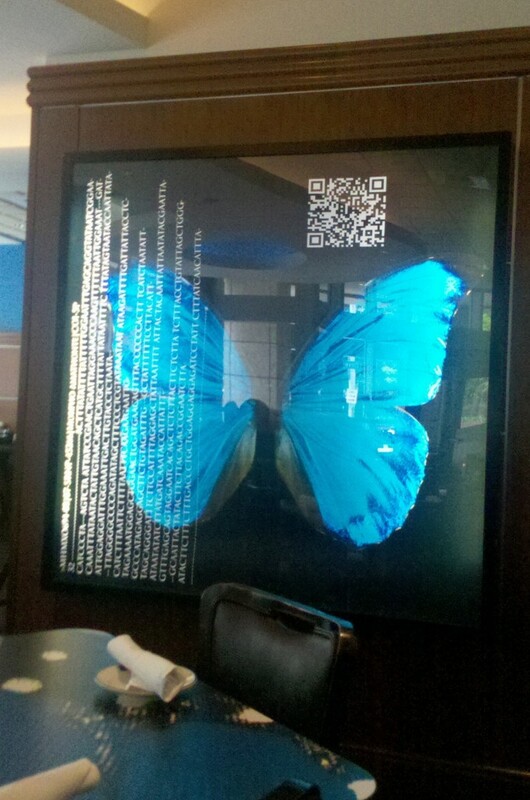 I really wanted to see what was behind the code because I was so captivated by the butterfly. In this case, the creative drew me in, made me stop, and took my attention. I was willing to engage with it. But it. just. didn’t. work. 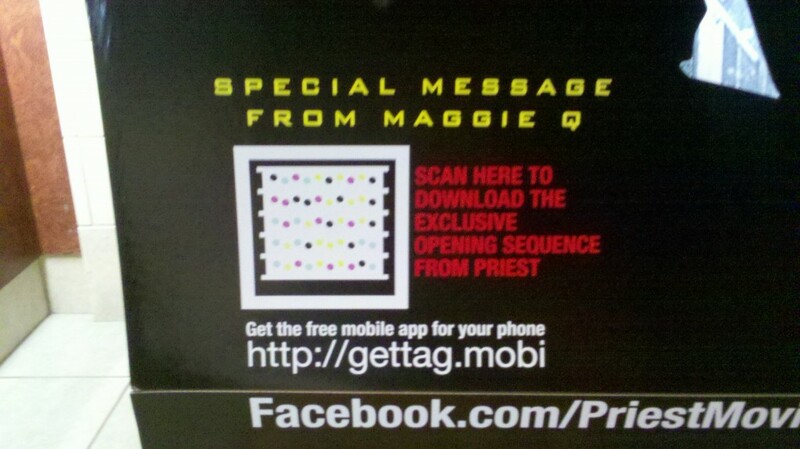 This entry was posted in Emerging Technology, Marketing, Mobile and tagged interactive, Interactive Out of Home, IOOH, QR Codes on 09/29/2011 by Mike Cearley. 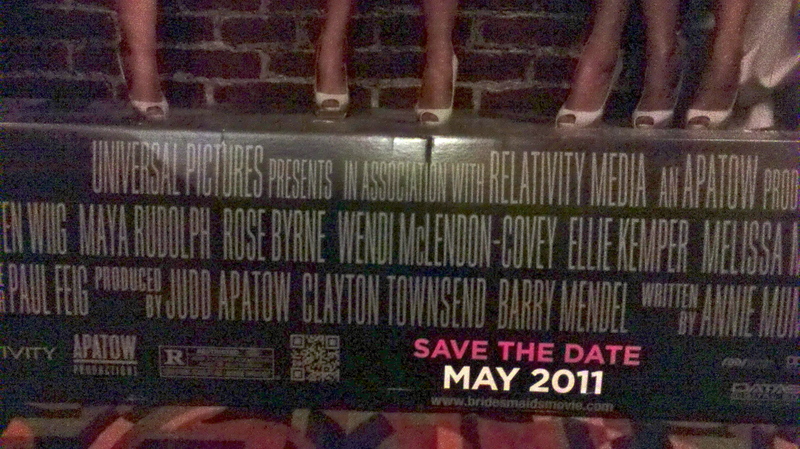 Then, there was another code on a movie ad. This one not hidden at all. Right in front of your face (waist, really), saying, “hey look at me, guess what you can do here!” This code was not lonely. It was surrounded by all sorts of friendly information. Instructions. Call-to-action. Expectations of special offers. All, with its different colors and fancy style. These two codes teach us an important and elementary lesson in context. Codes like this are intended for interaction. If interaction is your game, you must be clear and prominent to have any chance of meeting the intention. It’s this intention that must be present in the context of whatever you’re trying to drive interaction around. In this case, a code. But what about touch screens? Or check-ins? Or short codes? There are interactive whoosits and whatsits popping up all around us – on the places and things that we encounter every day. Soon, even all those physical screens outside of our homes and offices will be interactive, too. To have any chance at driving interaction, proper context must have a presence. Without it, assumptions are made. And assumptions, as far as emerging technology goes, will lead the way of the lonely code. This entry was posted in Emerging Technology, Marketing, Mobile and tagged gesture, interactive, Mobile, MS Tags, QR Codes, touchscreen on 05/01/2011 by Mike Cearley. I’m headed to New York for the Digital PR Next Practices Summit and Digital PR Awards (brought to you by PR News) tomorrow. I’ve got a special place in my heart for NYC – my wife and I lived there 2001-2005 when she was going to graduate school, we have many friends there, and our daughter was born there – so it’s always nice to go back. I haven’t been back in over a year. Anyway, we’ve (our Dallas office) been selected as a finalist for 4 different awards (Influencer Communications, Social Networking Campaign, Digital Marketing Campaign, and New Website) and I’m the representative to attend. Awards are a funny thing – they are a tangible piece of recognition for doing great work and for that reason alone, I think they are purposeful. (I believe strongly in recognition! But it doesn’t have to be an award). But if someone/groups/companies are driven by winning awards, then I have questions. In my opinion, awards shouldn’t be the purpose that drives ideas and solutions. It’s not whether or not this idea or that idea is “award-winning,” it’s whether or not this idea or that idea achieves the predetermined goals/objectives and ultimately impacts the client’s business. And sometimes, things just play out in a way that a random judging committee thinks they are “award worthy.” Such is the case here. I’m grateful and excited and I think it would be awesome for our group and our clients to be recognized for all of our work. More than the awards, I’m excited to attend the conference. I’m new to the “PR” world, but not new to the digital and social strategy/development world. So, it will be interesting to hear perspectives from different PR/communications leaders through my digital experience filter. There is a solid lineup from brands to agencies to entrepreneurs. I like the set-up, too – it’s a 1-day conference filled with 7 different sessions. The only option is whether or not to go. It’s going to be insightful because these sessions are centered around what I’m faced with every day, much more than what Out-of-Home component makes sense for a particular initiative. It’s crisis management and “emerging” online social tools and measurement and influencers – look at the agenda and you’ll get a snapshot of the issues I think about on a typical day. These are components that impact who, why, and how we communicate on a daily basis. This is the real driver of our solutions, not any particular channel, like OOH or mobile. But this is one of the things that I get so excited about with OOH, especially Interactive Out-of-Home – by touching people where they’re out and about, on the places and things around them, we have an opportunity to be more relevant and effective communicators. Every touch point is a chance to strengthen or weaken a relationship. The goal, though, is to touch the “right” people in the right way at the right time (how many times have you heard that?). So, tomorrow, I’ll get a chance to peak inside other people’s heads, which is generally a good thing. These are talented practitioners, so by and large, it should be a good thing. We’ll see. I’ll be blogging the entire day – stay tuned in if you’re interested. This entry was posted in Uncategorized and tagged Conferences, digital PR, interactive, OOH, PR News, PR News Digital PR Summit on 10/05/2010 by Mike Cearley. Man, that was intense. Particularly, the juggling of mediums to report on and with. It’s hard to blog, Tweet, take pictures, videos, post to this site and that site in such a short amount of time. Especially with no WiFi throughout the Convention Center. (I could only get online in a couple of places in the Convention Center.) It’s a process that I have not perfected by any means. But it doesn’t take away from the fun of it all, or the knowledge gained. While I did learn about many things, it wasn’t necessarily all things that I cared about learning. There’s always a lot of clutter at conventions like this and I can tell pretty quickly if it’s something that I a) care about b) want to be informed of or c) can’t process because it’s too complicated. And I’m not necessarily talking about “complicated” as in “over my head.” I’m talking about “complicated” as in “harder than it needs to be,” or “unnecessary.” There was lots of clutter this week – in messages, in technology, in “stories.” I have even contributed to the clutter, myself, with the rapid-fire regurgitation of information. This is the first conference that I’ve reported on like this so I’m still up in the air as to the best way to balance the barrage and sharing of information with well thought-out observations and opinions. I feel like I was much more heavily weighted on the former rather than the latter. Just like much of this conference felt to me. But now that I’m able to step away from it all, I am very pleased with all of the non-clutter that filled my experience. More than anything, as I said, I learned that there are some really great, passionate people in the industry. While this is not a new industry (digital signage has been around for a long time), it is a new medium to effectively engage and connect with people, and in that respect, we are all forging new ground here. I feel like right now, we’re where social media was 4-5 years ago. And just now, brands, marketers, and communicators are really starting to embrace social media and trying to use it as a tool for more than personal benefit. We are in the infant DOOH/IOOH stages. And we have some fantastic experts who have been doing this for many years. I was able to meet many of those people this week and I benefited greatly from it. My hosts were great, too. The folks at DSE are excellent. They are accommodating, they run a tight ship, and enable loads of access to industry experts, trends, and real-life examples. I really appreciate everything they did for me. The information was good, too. I don’t know that I necessarily learned anything ground-breaking that I didn’t already know (but that’s a good thing). It’s always good to have affirmation of thoughts, philosophies, and direction. The resounding theme for the week was “content.” It’s all about content, not the technology. Perhaps it was the nature of the sessions and people that I gravitated to, but this is not about technology. Technology is an enabler. We have nothing without meaningful, relevant, and appropriate-for-the-medium content. It gets back to my fundamentals – who are we talking to (audience), what are we trying to say (content), then how are we going to say it (technology)? A huge barrier for us, as advocates of this medium, is the desire for the next “bright, shiny object” and the perception that “once I have a digital and/or interactive screen, I’ll automatically get results.” (First of all, let’s define “results.” But that’s for another post.) I think there is a tremendous need for education, particularly in really utilizing this medium in the most effective ways. Technology is certainly a big part of it, but true effectiveness lies in understanding your audience and how to reach them in the places they go “outside of their home,” which all leads back to the content. Many people reinforced this in their own words this week. There was also a contingent of people who see where this medium is going and it’s not “digital.” It’s interactive. And as you know, by reading this blog, this is music to my ears. It’s funny because last year when I was here, everyone was showing the latest and greatest in true digital displays. There were big displays, thin displays, 3-D displays – all displays. Hardly any interactive displays. 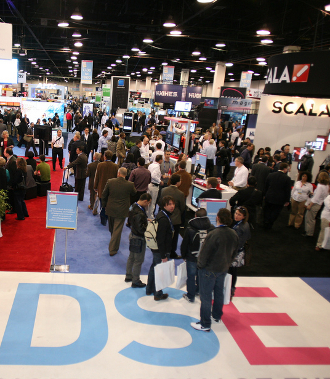 This year, it was all about interactive displays. 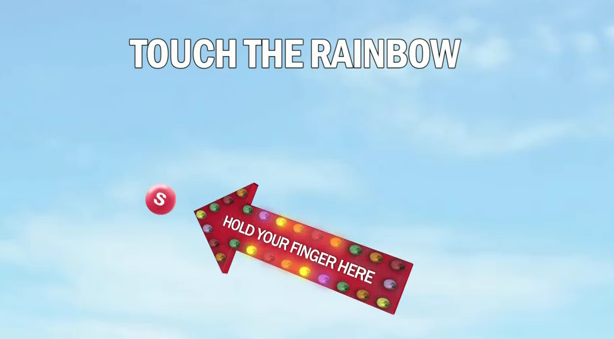 Single touch, multi-touch, gestural. Interactive was hot. But it was confined to interaction with the display screen only. I saw very few other enabling technologies, like mobile or GPS. The ones I saw though, (to be mentioned in the next post), made an impression on me. I think there is a group who is behind the curve, catching up to what the audience needs in interactivity (basic touch or gestural) and then there is a group who is ahead of the curve, accounting for what the audience wants in interactivity (connection through mobile/social). Regardless, it’s all interactive. This is the future, make no mistake. As far as the technology goes, I learned that there are a lot of companies doing the exact same thing. There are many powerful solutions out there, from the displays themselves to the boxes that enable them to the systems that run them. For the most part, they are whoosits and whatsits to me. I want to create a certain experience and I want someone else to tell me what the best technological solution (display, box, system) is to achieve that experience. That level of detail makes my head want to explode. God bless the technology providers and experts. I would just ask that there be a friendly consolidation. Can’t we all just get along? So there you have it. I’m sure that I’ll have moments in the coming week that inspire me to post something that I know I forgot, but that’s a good feel for what I learned. How’s all that for a long answer? This entry was posted in Uncategorized and tagged 11th Screen, Conferences, DSE 2010, GPS, interactive, Mobile on 02/26/2010 by Mike Cearley.